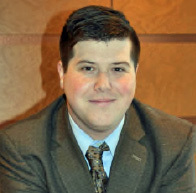 Volunteer Inspiring Pro Bono (VIP): Joshua M. Carmel, Esq. The Veterans Consortium is still accepting applications for the Veterans Legal Corps - AmeriCorps JD Program for both summer and fall fellowships in our Washington, DC offices. Click here for more information about the program and how to apply. "Pro Bono Representation before the U.S. Court of Appeals for Veterans Claims"
For any questions or more information, please email Leigh Hillebrand at Leigh.Hillebrand@vetsprobono.org, Coordinator, Volunteer Outreach & Education. To register or more information, please click here. Several extraordinary experiences and advice that stuck. That's what gave Joshua Carmel the guts to approach his boss a few months after graduating from law school to ask if he could take on a pro bono case. Lance Kalik, a co-managing partner of Riker, Danzig, Scherer, Hyland & Perretti in Morristown, N.J. didn't hesitate in his support, opening the door for Carmel to take his first case for The Veterans Consortium Pro Bono Program. Since then, Carmel, 27, has helped TVC recruit other lawyers to take pro bono cases, as well. For his efforts, energy, enthusiaSM and support of veterans above and beyond the call of duty, Carmel has been selected as The Veterans Consortium Volunteer Inspiring Pro Bono (VIP) for June 2018. As an undergraduate student at Gettysburg College, Carmel got his first taste of legal work as an investigator in the public defender's office in Adams County, Pennsylvania. His boss, Kristin Rice, "inspired people around her, especially instilling the desire to perform public service in general," Carmel says. He was working with Rice one summer when the office received a highly publicized death penalty case. That experience so affected Carmel and his mindset that he describes it as "one of the most visceral and formative experiences of my life, which marked a complete 180. It turned public defense on its head for me." It also made Carmel more open and thoughtful when he was involved with a second death penalty case as a legal fellow working at Emory University School of Law's Volunteer Clinic for Veterans. A founder of the clinic gave Carmel the advice to never let law school course work get in the way of his work as a lawyer. It's that advice that helped Carmel to not be afraid to jump right in. At the clinic, Carmel assisted on many service connection cases for veterans suffering from Post-Traumatic Stress Disorder (PTSD). "It painted a picture of a system that has had difficulty dealing with mental illness over time." He knew immediately, "This is what I want to do, these are the type of people I want to serve. It is a grossly under-served community." By choosing to work at a full-service law firm with a strong pro bono track record, Carmel, a native of Wall Township, N.J., is able to work as an associate in the Insurance and Reinsurance Group and serve pro bono clients, as well. The brief he wrote for the federal Veterans Pro Bono Program case he is working on was so convincing the office of the VA general counsel agreed to a joint motion to remand the case back to Board of Veterans' Appeals, where Carmel is awaiting a final ruling in favor of his client. While terrifying, it was incredibly rewarding," Carmel says of his first case. He credits his TVC mentor, Katy Clemens, with helping him each step of the way. The oldest of triplet brothers (if only by a minute), Carmel, says each brother blazed his own trail. But it wasn't until he found something to be passionate about, he says, that he learned to jump right in. "We're so grateful for the work Josh is doing on behalf of our veterans," says Courtney Smith, director of outreach and education for TVC. 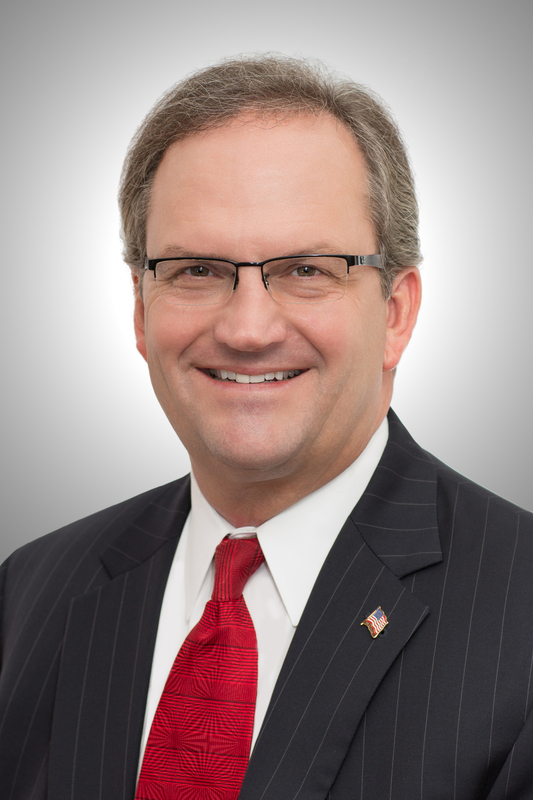 "He's a shining star among young attorneys and we're inspired by his enthusiaSM as a TVC AmbassadorSM in helping us recruit more attorneys to serve our nation's defenders and their loved ones through the federal Veterans Pro Bono Program." 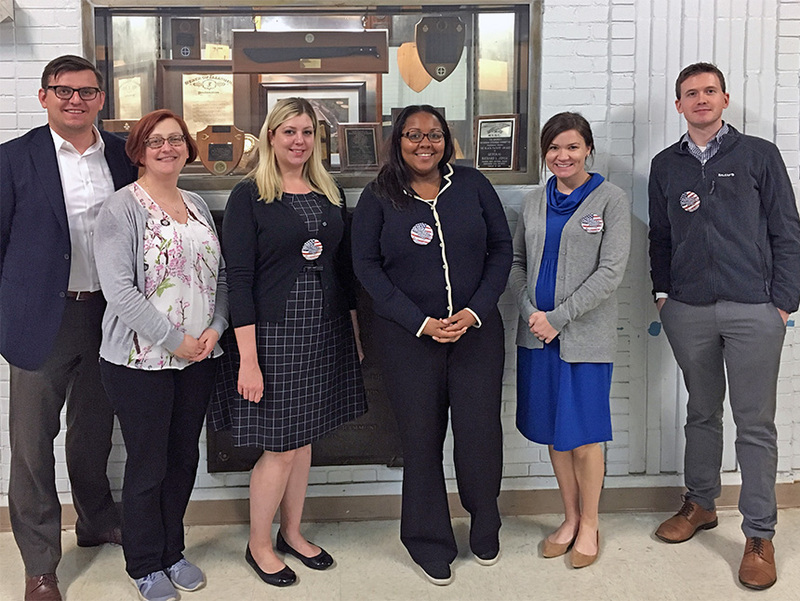 Our dedicated TVC National Volunteer Corps members and staff attorneys seek out every opportunity to provide pro bono legal support to veterans, and the Veterans Stand Down Clinic in Chicago was just such an event. In many cities across the country, Veterans Stand Down Clinics are annual events geared towards providing community support with a wide array of services to veterans. On 8 June, professionals from around the country gathered in Chicago offering eye exams, haircuts, clothing, and legal support to more than 350 veterans. TVC staff attorney, Samantha Stiltner, led the legal team alongside attorneys from the Chicago law office of Kirkland & Ellis to answer veterans' legal questions, triage their situations, diagnosis their legal needs, and make referrals to pro bono legal resources. They provided individualized support on their disability matters, and provided them with the necessary resources and attorney referrals for their cases. One veteran, Stiltner recalls, was so relieved and grateful to meet with an attorney face-to-face, and especially one who was well-versed in veterans law. For years he had tried to get clarity on the appeal process and was unable to receive valuable guidance. Stiltner talked with him in detail about his case, provided him the appeal paperwork needed, and walked him through the process of filing step-by-step. The Chicago Stand Down Clinic was an inspiring success attributed to the generous amount of support and enthusiaSM from the pro bono legal team that attended. "Events like this go particularly well when TVC staff partner with TVC National Volunteer Corps attorneys who are excited and motivated to help veterans, like these volunteers from Kirkland & Ellis," Stiltner said. "Their support made a significant impact on the number of veterans and quality of support we provided. We look forward to joining forces with them again next year." 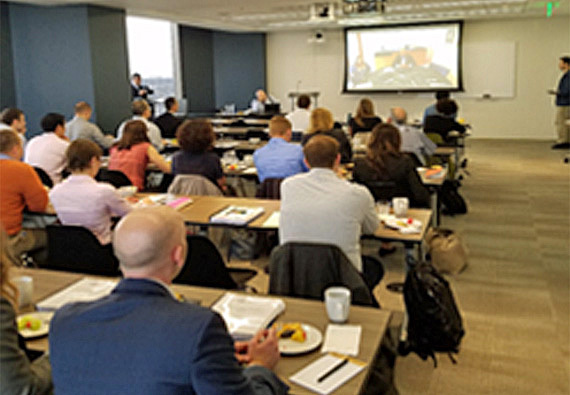 Employees of the Marriott International Law Department took time away from their very busy schedules to attend The Veterans Consortium Discharge Upgrade ProgramSM training on 14 June at Marriott International Headquarters in Bethesda, Md. These participants are now able to assist former service men and women who received Other Than Honorable (OTH) discharges. An "Other Than Honorable" characterization becomes a part of the veteran's record and can create a roadblock for veterans trying to access VA benefits and find jobs. We're happy to welcome these newest volunteers joining the ranks of our TVC National Volunteer Corps! 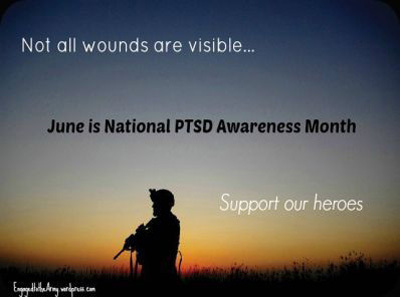 June is a month designated to create awareness of Post-Traumatic Stress Disorder (PTSD). It is particularly meaningful to The Veterans Consortium and to the veterans that we serve. Every day, we interact with and assist veterans, their family members, caregivers and survivors who have been impacted by and are coping with effects of this invisible wound. Many of these veterans are seeking our assistance to upgrade their discharge classification due to conduct related to PTSD and Traumatic Brain Injury (TBI). PTSD/TBI-related injuries resulting from service should not preclude these veterans from receiving benefits and respect. Pro bono attorneys can aid in upgrading the discharge to secure benefits eligibility for the veterans and restore the dignity of our country's warriors. This program is also an excellent opportunity for paralegals and administrative staff. To learn more about the TVC Discharge Upgrade ProgramSM please contact Danica Gonzalves at Danica.Gonzalves@vetsprobono.org. Courtney Smith, Esq., director of Volunteer Outreach & Education recently attended a week-long academic seminar on national security at the U.S. Army War College. 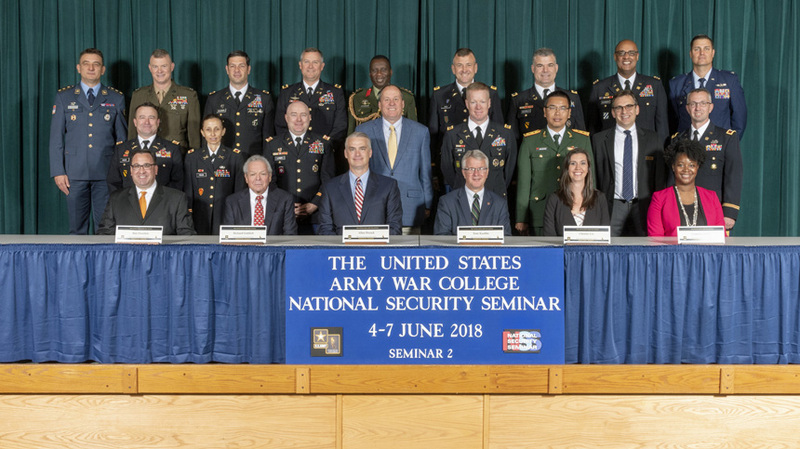 The seminar brought together some 160 business, government, academic and community leaders selected from across the country, with students of the U. S. Army War College. The National Security Seminar (NSS) was the capstone event of the Army War College's 10-month Master's Degree program in Strategic Studies. As part of TVC's national outreach, Smith represented the perspective of fellow American citizens in general — and the perspective of a veterans law practitioner in particular — in discussions with the next generation of senior leaders of the U.S. Armed Forces, in this capstone event that enhances student learning through exposure to a cross-section of American perspectives. Smith says it provided both students and participants with an opportunity to look at national security holistically. "The Army War College students gained an understanding of how we view the military, and we learned to better understand the military and their day to day life, their mindset," Smith says. "It really added to my depth of understanding of what an active-duty service member goes through, which gives me more insight into what the veterans we work with experience." 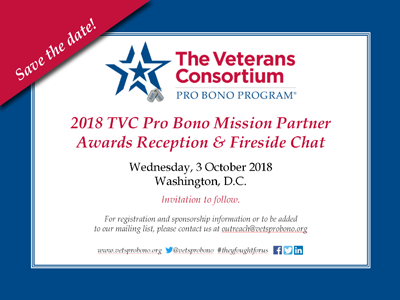 Please mark your calendars for the 2018 TVC Pro Bono Mission Partner Awards Reception & Fireside Chat. Copyright © 2018. 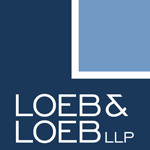 The Veterans Pro Bono Program.